My maternal grandmother's family are Germans from the Volga River Valley (Rosenberg) Russia who relocated to Canada in 1904. Alexander (Alex) and Susanna (Susie) Stricker stopped first at Winnipeg to get married. This couple then made a brief stop in Herington, Kansas where my grandmother was born and later moved to Leader, Saskatchewan. Several children were born to the family while living on their farm just outside Leader, including their daugther Eva. I believe this farm is the "Alex Stricker farm, five miles southwest of Leader" purchased about 1923/4 by Ludwig Kilthau Sr., who was likely a cousin since Alex's sister Charlotte (Lotty) Stricker married to Henry Kiltau (as reflected in"Pages of the Past"). The Alex and Susie Stricker family relocated to Portland, Oregon about 1923-1924. The photo is from the collection of Eva Stricker Rau Fritzler, the last of Alex and Susie's ten children, who recently passed away (2012). 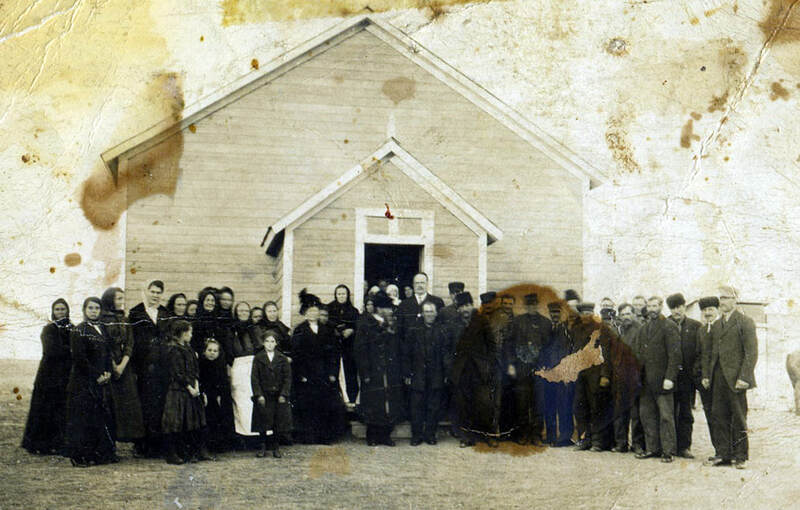 I believe that the photo was taken in Leader, perhaps outside the church in Leader prior to 1923? Or was it perhaps a photo in Winnipeg closer to 1904? I believe that the Strickers were Lutherans. In Portland they attended the Second German Congregational Church. I am hoping you or someone you know might be able to recognize the building, the era of clothing, a face in the crowd, or wonder of all wonders, maybe have seen this photo before and know what it is. Information and photograph courtesy of Barbara Ballew.